Summary: The passage of a new patent law marks end of years of debate and lobbying. New Zealand has finally passed a new Patents Bill that will effectively outlaw software patents after five years of debate, delay, and intense lobbying from multinational software vendors. Aptly named Commerce Minister Craig Foss welcomed the modernization of the patents law, saying it marked a “significant step towards driving innovation in New Zealand”. “By clarifying the definition of what can be patented, we are giving New Zealand businesses more flexibility to adapt and improve existing inventions, while continuing to protect genuine innovations,” Foss said. The nearly unanimous passage of the Bill was also greeted by Institute of IT Professionals (IITP) chief executive Paul Matthews, who congratulated Foss for listening to the IT industry and ensuring that software patents were excluded. Matthews said it was a breakthrough day “where old law met modern technology and came out on the side of New Zealand’s software innovators”. Here is the genius of this executive order. At its core it deals with something that is hard to communicate to a lot of people in a meaningful way. Here is the executive order for dummies version: This is essentially a core change to procurement and information publication. From a procurement perspective it basically means from now on, if you work in the US government and you buy a computer or software that is going to store or collect data, it sure as hell better be able to export it in a way that others can re-use it. From a information publication perspective, having the ability to publish the data is not sufficient, you actually have to publish the data. This change is actually quite wide ranging. So much so that it could be hard for many people to understand its significance. This is why I love the emphasis on what I would refer to as strategic data sets – data sets on healthcare, education, energy and safety. While the order pertains to data that is much, much broader than this, talking about datasets like the 5-Star Safety Ratings System about almost every vehicle in America or data on most appliances’ Energy Star rating brings it down to earth. This is information the average American can wrap their head around and agree should be made more widely available. The city is now using a unified desktop system, Limux, its own distribution based on the Ubuntu Linux open source operating system and open source applications, on 14,000 of the total 15,000 desktops, spread over 51 offices across the city. That is 2,000 more than it’s intended goal, using Limux on 80 % of its desktops. Hofmann confirmed that the city will now switch to using the LibreOffice, an open source suite of office productivity tools, replacing the current open source alternative OpenOffice, that is used since 2006. THE SPANISH REGION of Extremadura has announced that it will switch 40,000 government PCs to open source software. The government of Extremadura has worked out what many already know, that open source software can deliver significant cost savings over using proprietory software. The region’s government has decided to switch 40,000 PCs to open source software, including a customised Linux distribution called Sysgobex. According to the Extremadura government’s calculations, the switch to Linux and open source software will save it €30m a year, an amount that should come in particularly handy given Spain’s economic challenges. The government has already migrated 150 PCs to open source software in various ministries, including the department for Development, Culture and Employment. Na sequência de acção judicial intentada pela ESOP no Tribunal Administrativo e Fiscal de Almada, foi anulado o concurso público n.º 31A2012 relativo ao licenciamento e manutenção de software Microsoft, lançado pela Câmara Municipal de Almada em Setembro de 2012, no valor de 550.000,00 EUR. Segundo a ESOP, trata-se da primeira decisão judicial sobre esta matéria em Portugal, em que é reconhecida a ilegalidade deste tipo de procedimento para aquisição de licenças de software, apesar dos inúmeros alertas da associação para situações de concursos ilegais, que têm ocorrido nos últimos anos. 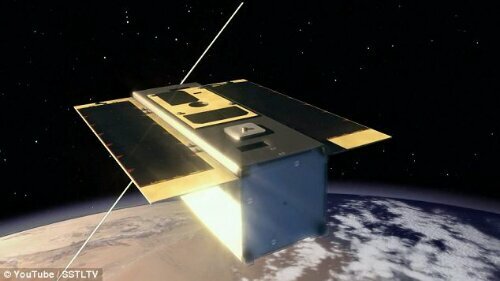 British space scientists are gearing up to launch the world’s first satellite run entirely using a mobile phone. The unique STRaND-1 satellite, developed by researchers from the University of Surrey, will be fully controlled by a Google Nexus phone during part of its six-month space mission. It will launch into a 785km sun-synchronous orbit on the Indian Space Research Organisation’s Polar Satellite Launch Vehicle (PSLV) from Sriharikota, India, on February 25. The satellite’s launch will be an interesting test of the oft-repeated claim that the mobile phone in your pocket has more computing power than was used to send a man to the Moon. At the heart of STRaND-1 is an unmodified Nexus One smartphone running an Android operating system, according to Dr Chris Bridges, the Surrey Space Centre’s lead engineer on the venture. ‘We haven’t gutted the Nexus. We’ve done lots and lots of tests on it; we’ve put our own software on it. But we’ve essentially got a regular phone, connected up the USB to it and put it in the satellite,’ he told the BBC. The smartphone is pressed up against a side panel of the 30cm-long, 4.3kg cubesat, so that it’s 5MP camera can look out and take pictures of the Earth and the Moon. On the 1st of October, 2012, we disclosed to Microsoft the following security vulnerability in Internet Explorer, versions 6–10, which allows your mouse cursor to be tracked anywhere on the screen—even if the Internet Explorer window is minimised. The vulnerability is particularly troubling because it compromises the security of virtual keyboards and virtual keypads. Whilst the Microsoft Security Research Center has acknowledged the vulnerability in Internet Explorer, they have also stated that there are no immediate plans to patch this vulnerability in existing versions of the browser. It is important for users of Internet Explorer to be made aware of this vulnerability and its implications. The vulnerability is already being exploited by at least two display ad analytics companies across billions of page impressions per month.